When you play a LoPrinzi instrument, you're playing more than just wood and strings--you're experiencing the culmination of the years of old world lutherie skills practiced by Augustino and Donna LoPrinzi. This father-daughter team proudly handcrafts each of the instruments bearing the LoPrinzi name. While their shop in Clearwater, Florida is small, the instruments they produce travel the globe, carrying the LoPrinzi name into recording studios and performance halls worldwide. Augustino LoPrinzi began making ukuleles on a bit of a whim. Long practiced in the design and handcrafting of guitars-both classical and steel string-Augustino was approached by Herb Ohta's manager to create an instrument for the ukulele virtuoso. Ohta-San found the resulting ukulele to be a delight-and the LoPrinzi name soon became a legend on these small instruments. Cradle a LoPrinzi ukulele in your arms and experience the joy of the simplest instrument-with a sophisticated sound. 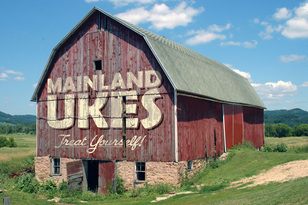 Mainland is a home grown family business dedicated to providing quality performance ukuleles	at a great price. This small company was started by people who love the ukulele and always enjoy meeting others who feel the same way. If you choose to buy from Mainland, you will be buying from people who play ukulele for fun on a daily basis They take time setting up each uke to make sure you will be satisfied	with your purchase. Check out their wide range of ukuleles, most featuring their unique and distinctive rope purfling. Sideways 8 Ukulele is a small up and coming business dedicated to crafting high quality custom instruments from a variety of domestic and eco-friendly materials. 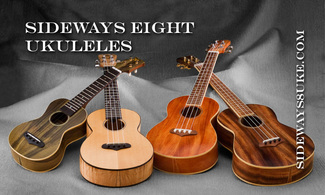 Sideways 8 Ukuleles are known for fine hand-finished craftwork, rich warm tones, and attention to detail. Features include radiused fingerboards, domed tops and backs, and exquisite hand-rubbed finishes. The hand shaped necks are narrow and designed for maximum ease of playability. If you are looking for a handmade instrument that is eco-friendly and 100% made in the USA, look no further then Sideways 8 Ukulele—fine ukuleles with an eco-twist! 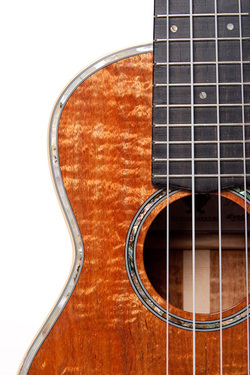 Kala Brand Ukulele is the result of an ever-expanding vision of quality, affordable ukuleles. With over 120 models currently offered, there is an instrument to fit everyone's tastes and budget. Kala also offers several unique instruments including the popular U-BASS, the amazing thin-bodied “Travel Ukulele”, and the pint-sized Pocket Ukulele. At Ohana you will find the many hand-crafted ukulele models - from soprano to baritone, mahogany to selected koa from the islands of Hawaii, conventional to vintage models, plus unique ones for those who are looking for something different. Ohana's goal is to provide the highest quality product at a reasonable price. Every ukulele that leaves their warehouse is carefully inspected and set up for maximum playability, regardless of model and price. Luna's mission is to craft fine stringed instruments with artistic sensibility that are comfortable, affordable, and inspire people of all ages and walks of life on their musical journey. Luna's ukuleles combine the best of traditional profiles and wood selection with fresh new designs to suit the unique players that are making the ukulele their own. 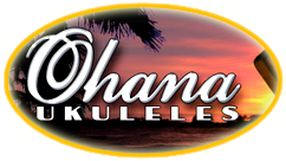 Dixie Ukuleles is a family owned Pono and KoAloha authorized dealer. In addition to new ukuleles, Dixie also offers pre-owned hi-end ukuleles and guitars. Dixie Ukuleles believes in fitting the ukulele to the player and in follow up service. When they sell a new Pono they remove and measure the saddle and take a pencil trace of it. This is recorded in the buyer’s file so if the buyer wants to change the action on his or her ukulele they need only order a new saddle. At Dixie they talk ukulele and happily answer all you questions. They offer a 10%+ discount on KoAloha and a 20% discount on Ponos, Pro Classic models excluded. Dixie Ukuleles also has a good stock of Pono seconds including PC models at significant discounts.